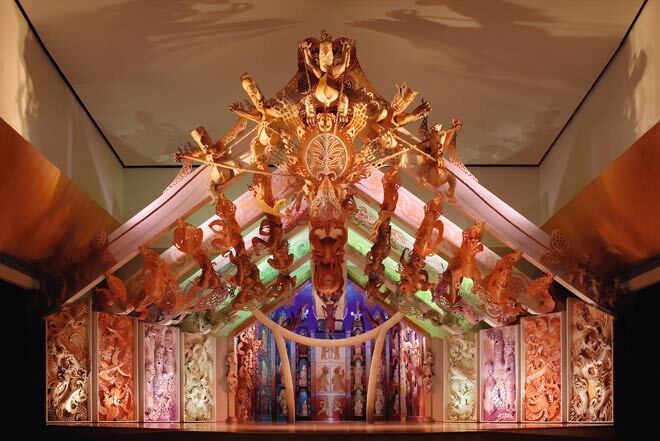 The extraordinarily innovative meeting house Te Hono ki Hawaiki opened at Rongomaraeroa, the marae of the Museum of New Zealand Te Papa Tongarewa, in 1997. Master carver Cliff Whiting headed the construction team. He chose to use customwood (MDF) rather than increasingly rare and precious native timbers, which in turn enabled dramatic 3D sculptural effects. To finish these unprecedented carvings, Whiting used colours not available to carvers in earlier times.